Global Insights: Chinese-Russian Relations the Best Ever? Chinese and Russian leaders meet frequently, but last week was special. 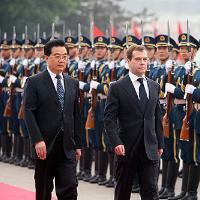 President Hu Jintao of China and President Dmitry Medvedev of Russia conferred three times over the course of four days -- at the June 15-16 Shanghai Cooperation Organization summit in Yekaterinburg, then later on June 16 at the first-ever heads-of-state meeting of the BRIC countries (Brazil, Russia, India, and China), and again afterwards when Hu made a state visit to Moscow from June 16-18.